This Elephant room thing is getting a little bit out of control by the minute. So the issue that people have concerning T.D. Jakes on the show and embracing him as a brother is his heretical theology: (1) His view of the Trinity and (2) his word of faith prosperity gospel. So how does the Elephant Room responds to this? Character assassination…and attacking African American Christians who speaks out against TD Jakes. Talk about a red herring from the issue about the centrality of the Gospel. I can’t believe it has to get this low, to pull the race card, and a big red herring from the main point. The issue is the theological content that T.D. Jakes subscribe to! But can’t one also turn this psycho-assertions against the very ones saying it? If you watch this clip, the “White Elephant” (pun intended) that’s in the room is the host, James MacDonald. These guys are invited on the show to talk about African American Reformed preachers who speak out against T.D. Jakes. It seems as if these guys are trying to gain access into the Elephant in the Room Volume 2, a world that is dominated by the host who is an older white guy. It seems that the guy is here pontificating his opinion against some other Black preachers to gain more leverage into the crowd who watches the Elephant Room. Four articles from this past month of January on Presuppositional Apologetics from the internet. 1.) The Laws of Logic and Reformed Philosophy” by Jamin Hubner. 2.) “Why I am not a Panentheist” by James Anderson. Written in light of the recent apostasy of Michael Sudduth. 3.) Bahnsen’s Great Debate still for today. 4.) Book Review: Answers Book for Teens. 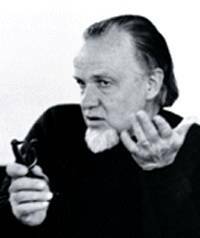 It’s Francis Schaeffer’s 100 years anniversary! His apologetics works has shaped much of Evangelical life and worldview. You can have a chance (for a limited time, how long I don’t know) to win a complete set of his work by clicking here. Ever heard of people using the argument that a behavior is right on the basis of it being observed in the animal kingdom or nature in general? This kind of argument seems to appear from time to time in support of homosexuality. This example provides an illustration of a defeater for that kind of argument. It is an image that is sure to shock many people. An adult polar bear is seen dragging the body of a cub that it has just killed across the Arctic sea ice. Polar bears normally hunt seals but if these are not available, the big predators will seek out other sources of food – even their own kind. The picture was taken by environmental photojournalist Jenny Ross in Olgastretet, a stretch of water in the Svalbard archipelago. “This type of intraspecific predation has always occurred to some extent,” she told BBC News. The journalist was relating the story behind her pictures here at the 2011 American Geophysical Union (AGU) Fall Meeting, the largest annual gathering of Earth scientists. A paper describing the kill event in July 2010 has just been published in the journal Arctic. It is co-authored with Dr Ian Stirling, a polar bear biologist from Environment Canada. Ross had approached the adult in a boat. She could see through her telephoto lens that the animal had a meal, but it was only when she got up close that she realised it was a juvenile bear. 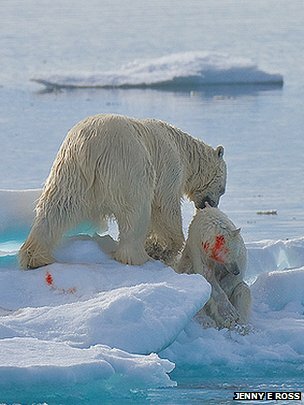 The kill method used by the adult was exactly the same as polar bears use on seals – sharp bites to the head. POINT: As Cornelius Van Til, John Frame and Greg Bahnsen expounded in their teaching about apologetics, a Christian theory of ethics must begin with the revelation of God. Ethics should be more than being building upon the foundation of a behavior observed in nature. Such an ethical theory (justifying a behavior on the basis of observation of it’s occurrence in nature) is problematic. In the same way, if one believes that cannibalism is wrong, this news story about the observation of cannibalism by polar bears would suggest otherwise assuming this method of ethical justification. Such a theory is problematic and must be rejected. Non-Christian (NC): Well, you can’t say that _____ is wrong, because scientists have observed that behavior in nature. Thus, the act of _______ is natural and should not be prohibited or condemned as wrong. Christian (C): Am I hearing you correctly that your argument is that _____ is ethically permitted because ______ is observed to have happened in nature? C: By chance, you do believe that it’s wrong to kill and cannibalize someone don’t you? NC: Yes of course I believe it is wrong. C: What about the fact that this behavior is observed in nature? Here’s a recent BBC article that has a picture of a polar bear killing and cannibalizing another polar bear. I could cite more examples of cannibalism occuring in nature. But the point I want to make to you is this: Does this justify cannibalism as right? I want to challenge you to reconsider this type of argument justifying an act just because it’s observed to have happened in nature. Again, does this fact that cannibalism occur in nature justify it as right? i. What is wisdom in the Hebrew Bible? ii. Hebrew Wisdom literature will thus focus on the above subject. iii. Proverbs is categorize under Wisdom literature. 1. Usually second person in nature. 2. Didactic in nature, for the listener to do something. 3. Largely found in Proverbs 1-9, 22:17-24:22, 31:1-9. 1. Usually third person in nature. 2. General observation about life. 3. Largely found in Proverbs 10-22:16.
a. All the principles in Session Six apply here as well. b. Identify whether it is an instruction or a saying. i. Instructions should be treated as instructions. ii. Proverbs that are in the sub-genre of Sayings must especially take note of principle “d” and “e” here. i. Biblical Proverbs cannot be false, because the Word of God is never false. ii. Biblical Proverbs are thus true, but they present a slice of reality. iv. Thus, a Proverb should not be view alone, but compared with the canonical whole for more fullness. v. Objection:This “slice of reality” is unbiblical and a theory invented to get away from the problem of Proverbs being not true. 1. First off, this “slice of reality” approach does not conflict with any Biblical truth. a. Rather, this approach makes the entirety of Biblical Proverbs (and its relationship to other Scripture) coherent. b. It is important that one might not like the idea of “slice of reality” because it make sense of proverbs, but that is a far from attributing the “slice of reality” approach as not making any sense. i. In planning for success, it is wise to have many counselors (Proverbs 15:22). ii. Yet, it is God’s counsel and will which will be fulfilled over the plans of man (Proverbs 19:21). iii. Synthesis: One seek wisdom from those who can be deem counselors, while acknowledging that God’s plan will prevail over man’s plan. Thus, seeking the Lord’s wisdom and guidance is essential. i. Does the wicked always get their punishment in this side of eternity, such as the wicked being in need of food such as suggested in Proverbs 13:25? ii. Yet, injustice can also be done against the poor on this side of eternity (Proverbs 13:23). iii. Synthesis: While injustice can be done by the wicked, God disapprove of the wicked and can even bring punishment such as with hunger even before the commencement of the final judgment. i. Note its near proximity, where it is highly implausible that the writer write contradictory statement back to back. ii. The “Slice of Reality” paradigm make sense of the text. 3. Yet, “slice of reality” is used in secular context, but there is no objection to it. i. The first proverb captures a slice of reality that in some circumstances, many help makes things easier. ii. Yet, the second proverb captures a slice of reality that in some circumstances, many help makes things more difficult. iii. Both slice of reality are equally true. b. Thus, “slice of reality” is not just an approach only toward Biblical Proverbs, but in other areas as well and not a ploy to run away from a problem. vi. Since a Proverb is a slice of reality, interpreting and applying a Proverb also require wisdom. 1. Requiring the wisdom to properly interpret and apply a Proverb should lead a believer to be on his knees, praying for wisdom which is given by God (James 1:5). 2. Requiring the wisdom to properly interpret and apply a Proverb should lead a believer to practice interpreting Proverbs. ii. This is also known as the Doctrine of the Two Ways. iii. This framework is helpful when one encounter proverbs that provide indicative observations, with no written instructions. e. Pay attention for the any values given. i. Proverbs provide the lens for value judgment. 1. This is when a subject’s value is stated as the same with another object. 2. For example, see Proverbs 10:15, 10:20, 10:23. 1. This is a comparison of two objects, where one’s value is greater than another. 2. For example, see Proverbs 12:9. 1. This tells the reader God’s view of right and wrong. 2. For example, see Proverbs 15:8. 1. This has a way of capturing the truth in a ironic and memorable way. h. Concentrate on what the text teach about who God is. i. It is always important to be theo-centric in our interpretation. ii. The fear of the Lord is foundational in grasping Proverbs (Proverbs 1:7, 9:10). iv. Lennart Bostrom, has identified Proverbs’ creation theology, God’s retribution and order, and theology proper (God’s transcendence, sovereignty and personal). Gordon Fee and Douglas Stuart., How to Read the Bible for All its Worth, (Grand Rapids: Zondervan), 206. Donald K. Berry, An Introduction to Wisdom And Poetry Of the Old Testament, (Nashville: Broadman And Holman Publishers), 5. Derek Kidner, An Introduction to Wisdom Literature: The Wisdom of Proverbs, Job and Ecclesiastes, (Downers Grove, Illinois: Intervarsity Press), 25. Gordon Fee and Douglas Stuart., How to Read the Bible for All its Worth, (Grand Rapids: Zondervan), 217. Ted A. Hildebrandt, “Proverb” Cracking Old Testament Codes, (Grand Rapids: Baker Book House Company), 239. For a fuller treatment of the theological basis for this claim, see “Doctrine of Inerrancy” Part I through III, under systematic theology articles at http://www.teamtruth.com. Ted A. Hildebrandt, “Proverb” Cracking Old Testament Codes, (Grand Rapids: Baker Book House Company), 248. Derek Kidner, An Introduction to Wisdom Literature: The Wisdom of Proverbs, Job and Ecclesiastes, (Downers Grove, Illinois: Intervarsity Press), 26. Donald K. Berry, An Introduction to Wisdom And Poetry Of the Old Testament, (Nashville: Broadman And Holman Publishers), 122. T. A. Perry, Wisdom Literature and the Structure of Proverbs, (University Park, Pennsylvania: The Pennsylvania State University Press), 40-44. Ted A. Hildebrandt, “Proverb” Cracking Old Testament Codes, (Grand Rapids: Baker Book House Company), 243. Donald K. Berry, An Introduction to Wisdom And Poetry Of the Old Testament, (Nashville: Broadman And Holman Publishers), 129-131. Derek Kidner, An Introduction to Wisdom Literature: The Wisdom of Proverbs, Job and Ecclesiastes, (Downers Grove, Illinois: Intervarsity Press), 17. Lennart Bostrom, The God of the Sages: The Portrayal of God in the Book of Proverbs, (Stockholm, Sweden: Almqvist & Wiksell International). I don’t know how long this limited time offer will last, but you better not wait! 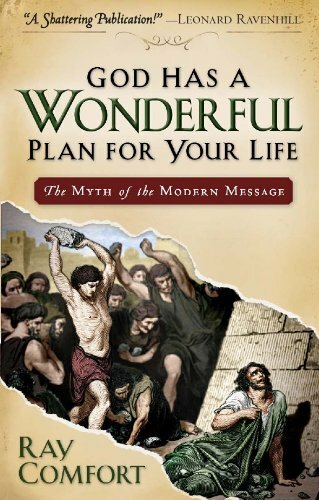 Living Waters Publication is giving out one free copy per customer the book by Ray Comfort titled, “God Has A Wonderful Plan for Your Life” which talks about the myth and unbiblical nature of much of modern evangelism, and then schools the readers on the use of the Law in witnessing. Go here to get the book! My review of this book can be read by clicking HERE. A short book about dualism (body versus mind/soul) that has crept in throughout the history of thought and Christian theology/philosophy, and it’s devastating consequences. Could have benefited from being longer in length in the defense of his thesis–but I did appreciate what he was saying and the examples of dualism at least should make the readers be conscious of looking for the wrong antithesis of body vs mind as the root of necessary problem, and the need for the Christian to see the main problem man has is ethical in nature (sin) rather than metaphysical. A Van Tillian bent in this book.